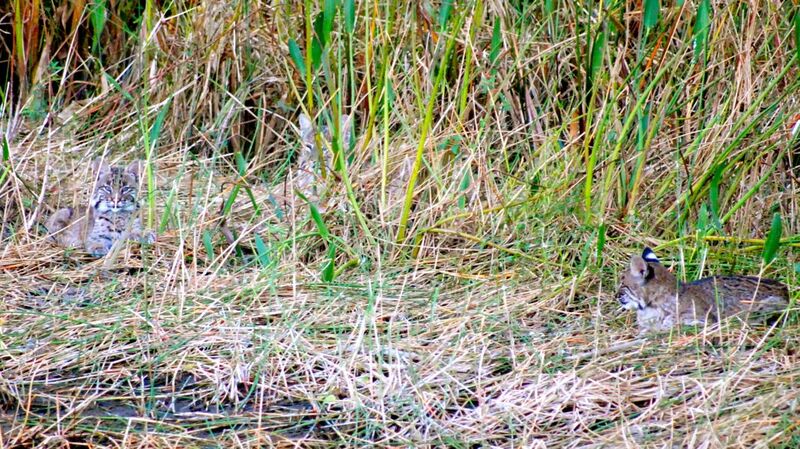 Bobcat, photographed at Green Cay Nature Center, Boynton Beach, Palm Beach County, in 2012. 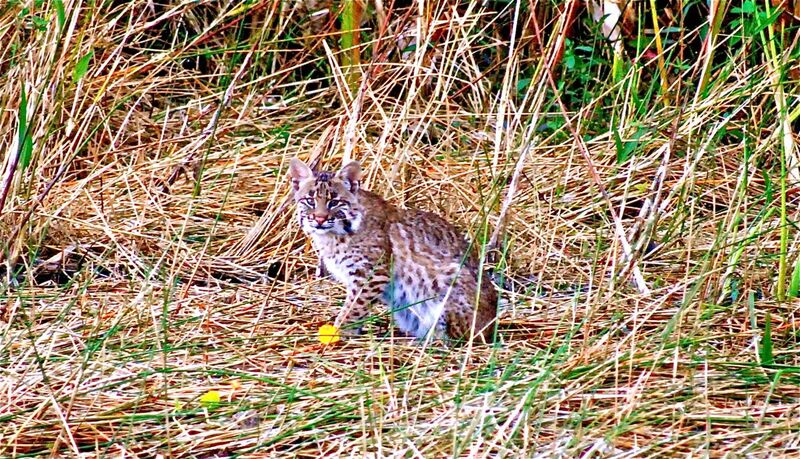 Say hello to Lynx rufus floridanus — the bobcat, Florida style. This big cat, relatively speaking, is about the size of medium dog. Bobcats are carnivores, as you might expect, eating rabbits, squirrels, rats and other small mammals. In winter, birds become an important part of their diet. Bobcats are adaptable critters, found throughout North America and throughout Florida in a variety of habitats — deep forests, swamps and hammocks. They can be found living in the 'burbs as well as the boonies. According to the Florida Fish and Wildlife Conservation Commission, bobcats have adapted well to human development. The International Society for Endangered Cats considers the bobcat the most successful wild cat in North America. Bobcat are territorial, and in more rural areas, they'll claim a range of 5 or 6 square miles, but in more developed settings, that will drop to 1 or 2 square miles. By comparison, a male Florida panther will have a range of 200 square miles. Bobcats are nocturnal. They do their hunting at night, but sleep only 2 or 3 hours, so they're often active during the day. They rate among the top terrestrial predators, able to take down animals 10 times their own weight. But even bobcats have reason to fear the alligator. The bobcats shown on this page are members of a family, one of which became a meal for a large gator. Bobcats are about two feet tall, can reach thee-and-a-half feet long and weigh as much as 30 pounds. They tend to be bigger farther north and west in their range, smaller in the south. Their fur is gray to red, with random dark stripes and patches. Their namesake "bobbed" tail is three to six inches long. ISEC says a black, or melanistic, bobcat was captured and released in Florida in 2007, but they are extremely rare. 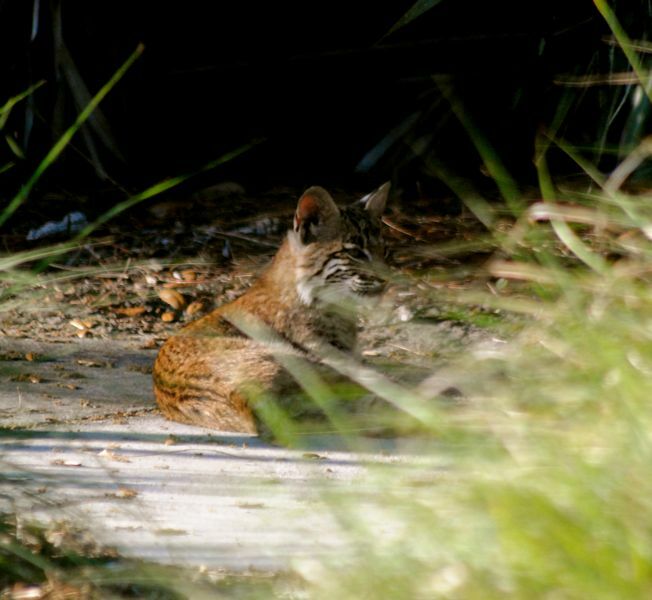 Bobcats in Florida breed between August and March, peaking in February and March. Litters are between one and four; gestation is 50 to 60 days. The eyes of newborns remain shut until the ninth day. Kittens are weaned within two months, and mom teaches them how to hunt. The young will stay with their mother until the next breeding season. Males will breed with several females, but females will breed with only one male. The only time bobcats have anything to do with each other is during breeding. Overall, bobcat numbers seem to be increasing. 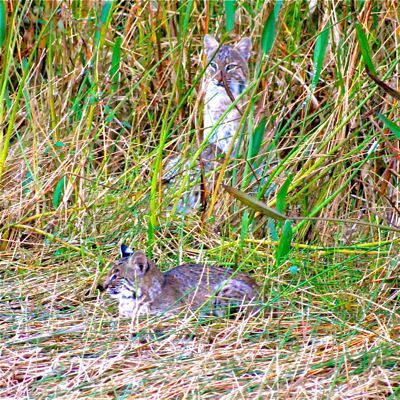 The ISEC cites a 2010 study that found bobcat populations increasing in every state in the lower 48 where its found with one exception: Florida. The study estimates the U.S. population between 2.4 million and 3.6 million. Bobcats in the wild have been known to reach a 13th birthday. In captivity, they've survived to 33. Despite their success, bobcats face several threats. They are legally "harvested" for their skins in 38 states, according to ISEC. It is legal to trap bobcats in Florida with a license and in season. The FWC, however, downplays the value of bobcat pelts. Disease is also a problem, but the biggest threat is habitat fragmentation.